The Selens slider for follow focus is a lightweight, portable camera slider supporting up to 5kg. It is made of reinforced aluminum, and the slide rails are on the inside where they’re better protected from bumps and other types of impact. The Slider is designed with slidable base plate with locking knob, which allows you to add resistance to the movement of the slider carriage. Additionally, the adjustable rail with alignment will allows you for follow focus, wide angle and parallel photography. 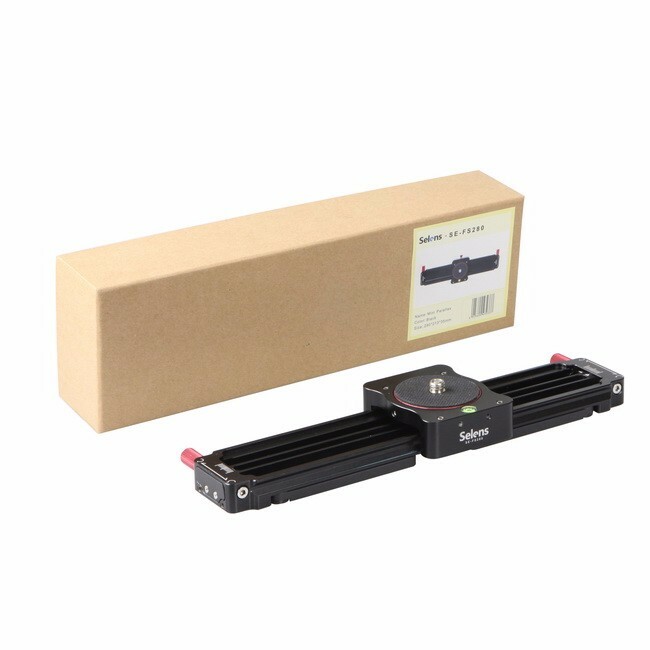 – Lightweight, portable camera slider supporting up to 5kg. – 280mm total length, 255mm travel distance. – The precise alignment and two adjustable knob on the ends for different tilt angle. – Slidable base plate with the locking knob on the base plate and allows to use as a friction brake. – Slide rails positioned are on the inside for extra protection. – Portable and lightweight at 730g. – Compatible with different camera, DV, camcorder and etc. – Ideal for travel allowing you to capture smooth live motion and time lapses with single camera. – To take up less room in your camera bag than other sliders. – Fout legs when placed on the flat surface for additional stabilities. – Ideal for close up shots. – Travel friendly and fits into virtually any camera bag. Fit DSLR, camcorder and etc.